Whisk together all ingredients in a glass mixing bowl. In a larger freezer bag or glass mixing bowl, marinate four or five 1-inch-thick fillets of a suitable grilling fish - Mahi-Mahi, Tuna, Salmon, Halibut - for 15 minutes, to not more than 3 hours. Oil a hot grill and grill with the skin side up for 3 or 4 minutes. 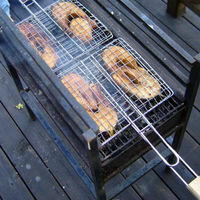 Carefully turn (only once) and grill just until it is opaque and the fillet starts to flake most of the way through when bent. Remove to a warm platter.